The first thing to do is to download the latest versions of the installation programs for the Windows version of the Oracle JDK (or a suitable alternative) and TextPad. The links go to the downloads for JDK 7 (32 bit) and TextPad 6. These are the latest versions at the time of writing. I assume you have WINE installed. If not, simply grab it from your package manager (Synaptic, YaST, etc). The file name above is correct for JDK 7 (32 bit) at the time of writing. The file name may have changed by the time you read this, or if you have the 64 bit version. Just substitute (in place of jdk-7u11-windows-i586.exe) the name of the installation executable that you downloaded. Accept all the defaults during the installation. The TextPad download is a zip archive containing a file called setup.exe, so navigate to the location of the zip file and unzip it to somewhere convenient. I unzipped it to a directory off my downloads directory called, unimaginatively, ‘textpad‘. Once again, you should just follow the defaults during installation. 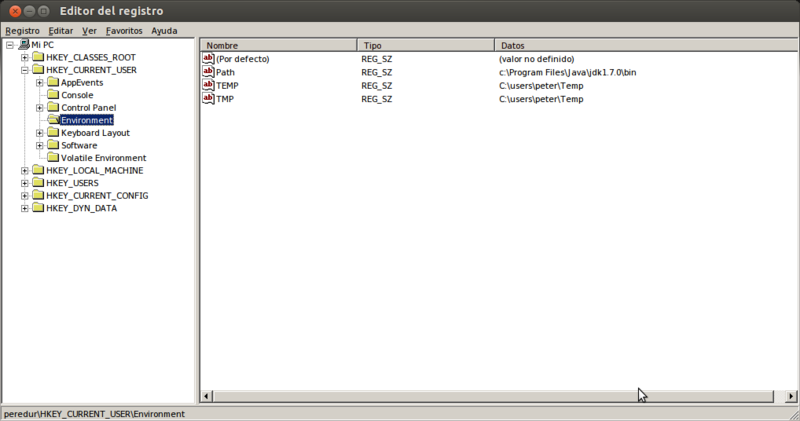 Select HKEY_CURRENT_USER/Environment in the tree view in the left hand panel. Now, assuming that you can’t see a value for “Path” (case insensitive, remember), right-click on the right-hand panel and select New > Value. The new value should be called “Path“. If a value for “Path” (or “PATH” or “path” or whatever) already exists, you will just need to modify its data. Remember that Windows path entries are separated by semi-colons. If you accepted all the defaults when you installed the JDK, your path will be the same as mine. Click on “Accept” and that’s it. You should see the path to the JDK bin folder on the path. The first thing to do after you have TextPad up and running is to check that the Java Tools are installed. Open the Preferences dialog from the TextPad main menu by selecting Configuration > Preferences and then select “Tools” in the tree view in the left hand panel. If these entries are absent, click on the “Add” button and select them from the menu. They will then be added to the tree view. My HelloWorld class will now be in that package and will not clash with all the other HelloWorld classes I have all over the place! If this folder structure is absent, Java will simply report that it cannot find the class. So we need to make a small adjustment to our TextPad configuration. Go back to Configuration > Preferences and select Tools > Compile Java. 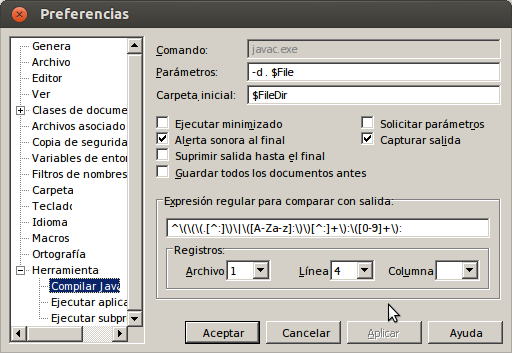 The effect of this is to pass the ‘-d‘ option to javac, specifying the current directory (i.e. the one that contains the .java source file, represented by the full stop (.) in the parameters string). When this is done, the compiler (javac) looks to see if there is a package declaration in the source and, if there is, it creates the necessary directories. Now you can compile your Java file as before (Tools > External Tools > Compile Java) and you will see, if you examine your project’s file system, that the necessary folders have been created and that the .class file is in the correct place. You will now be able to run your application (Tools > External Tools > Execute Java Application) without errors. mind if perhaps I personallyuse a bit of of your own concepts? Of course, Philip. Please go ahead. If you copy anything directly, a citation would be nice, but please feel free to use anything I’ve written as though it were your own.